Without further ado, here are 4 furnace problems you might encounter in Brookfield, Illinois. 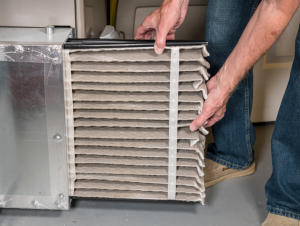 Easily the most common problem you’ll encounter with your furnace is a dirty air filter. These filters come into contact with substantial amounts of dust and residue, leaving them dirty soon after being installed. As a general rule of thumb, you should change your air filter every 1 to 2 months. However, if you have pets in your home (ie. dogs and cats), you might want to change the filter even more frequently. If you don’t change your air filter in a timely manner, undue stress will be put on your furnace. This will cause it to work harder than it otherwise would need to, wasting energy, money, and hastening the demise of the furnace. Another fairly common furnace problem is a malfunctioning thermostat. Every once in a while, something will occur that causes your thermostat to read different temperatures than what your furnace is producing. There are a number of reasons for why your thermostat might be doing this. Its sensors could be bad. Its wiring could be impaired in some manner. Its batteries could even be dying. If the problem isn’t fixed with a battery change, you’ll probably need to bring in an HVAC repair specialist. He or she should be able to find the source of the problem, and right any wrongs. Your furnace’s pilot light is vital to its overall functionality. This light if the flame that you see burning inside of your furnace, and it is responsible for creating heat within the furnace. Unfortunately, on occasion, pilot lights will go out. When they do, the furnace will cease to function as intended. There are a number of reasons for why a pilot light would go out. However, in most cases, dirty or deteriorated thermocouples are the culprit. Fortunately, a furnace repair specialist can swap these out in no time. Another vital component within furnaces is the blower motor. This component makes use of a number of internal mechanisms, one of the most important of which is the blower belt. Unfortunately, while they’re hugely important, blower belts are prone to wear and tear, and damage. Over time, as they take on wear and tear, they can deteriorate, eventually breaking down entirely. You can generally tell when a blower belt has broken or is loose because it will produce an annoying, high-pitched, squeaking sound. There’s only one thing you can do to fix a blower belt: have it replaced. An HVAC repair technician will be able to get the job done for you. If your furnace is experiencing problems, it’s wise to have it fixed as quickly as possible. Looking for professional furnace repair in Brookfield, Illinois? AE Power Plumbing, Heating, and Cooling has you covered. As the premier provider of furnace services in the Brookfield area, we have repaired thousands of furnaces. Our team of seasoned HVAC specialists looks forward to assisting you.